In the lobby of Tesco's head office, you can't help noticing a row of clocks telling the time in 12 different countries. Unlike for some businesses, this display of internationalism is no empty gesture. The UK's largest retailer now operates more than 800 stores abroad, stacking up sales of more than £10bn in 2005-6. Tesco - which made a £2.25bn underlying profit last year - sees international expansion as the main engine of its long-term growth. For several years after opening its first foreign store in the early 1990s, Tesco trod rather carefully outside the UK. But now it is expanding at full throttle. It opened more than 230 new stores last year or so and, next year, will open its first outlet in the US. 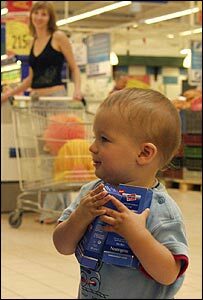 City analysts remain impressed by Tesco's strategy, saying it is well thought out and executed. "They have gone into low risk areas, less sophisticated retail markets where they have a clear run at it," says Richard Ratner, head of equity research at Seymour Pierce. "If you look at these markets, they have done very well." Listening to Philip Clarke, Tesco's executive director in charge of the firm's global operations, one would be forgiven for thinking that the recipe for its success is rather simple. He says it has applied much of what it has learnt in the UK - where it has a 30% share of UK supermarket sales - abroad. In most markets, Tesco has started by opening a small number of very large hypermarkets. Once it has built sufficient sales and customer awareness, it has opened other formats such as smaller convenience stores or specialist outlets. At the same time, it has used its global supply chain and retail expertise to manage stock and to keep overheads to a minimum. "There are so many similarities between what we do here and what we do in the rest of the world," says Mr Clarke. "Our latest distribution centre that opened in Peterborough is exactly the same as the one which opened in Poland and Hungary." This formula has allowed Tesco to expand with remarkable speed in certain markets. 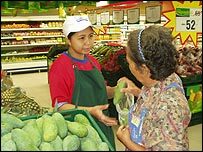 Despite only entering Thailand in 1997, Tesco is now the market leader with 55 hypermarkets and more than 100 Express convenience stores. "We have a format that can reach every sector," Mr Clarke says of Thailand. "It is not in all the places we would like it to be. That's the next challenge." Critics have questioned Tesco's approach, saying it has used the hypermarket as a "battering ram" to force its way into a market, before extending its reach into smaller, niche areas. Tesco counters by saying that each market is different and it has to adapt to local conditions. In most markets Tesco has to work with a local partner and, in most cases, it has retained that company's store identity. "Unless there is an advantage to using the Tesco brand, we don't," Mr Clarke says. "In Turkey, customers do not know what Tesco is but they know what Kipa is so we are keeping it as Kipa." This apparent pragmatism has impressed some experts, who compare Tesco favourably with other UK retailers operating abroad. "They have adapted their store formats very well and have been very good at working with local management," says Rita Clifton, chairman of leading international brand consultancy Interbrand. "They do have an extremely clear idea about what their business is about, but they are not macho about how they apply it. "There are some firms that if they buy a company in another country, putting their brand name on it as quickly as possible is almost a source of corporate pride." But Tesco's rapid foreign expansion, like that of other chains such as Wal-Mart and Carrefour, is a cause of concern to many people. Critics insist multinational retailers are squeezing out small stores and threatening diversity of products and consumer choice. "The inevitable trend is that traditional retailers such as small 'mom and pop' stores and wet markets are gradually making their irreversible exit from the Thai retail trade," Euromonitor International said in a recent report, seemingly backing such critics. There are concerns that firms such as Tesco are taking advantage of weaker regulation in developing countries to expand rapidly. "It has political and cultural as well as economic implications." He says developing countries must put safeguards in place to ensure that foreign multinationals reinvest a fair share of their profits there and provide some guarantees for local suppliers. 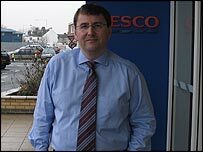 "Tesco's reputation probably proceeds it and that has probably triggered some of the concerns aired in central Europe and India," he adds. "Tesco will come to these markets with baggage because everyone is aware of how large, powerful and sophisticated it is. "People are aware of the nature of the debate about Tesco in its home market and are worried about the same things." As Tesco grows ever bigger in more countries, it has inevitably faced criticism from consumer activists and environmental groups. Regulators are also paying more attention to its activities. Brussels recently referred Tesco's acquisition of three stores in Slovakia to domestic regulators, claiming the deal could potentially reduce competition in certain areas. There are signs of a growing political backlash as well. Polish Finance Minister Teresa Lubinska was recently quoted as saying that Tesco's stores did not represent real investment and were "not vital for economic growth". Although she has since retracted her remarks, they undoubtedly struck a chord with those worried about Tesco's dominance in the UK being replicated in emerging economies. For its part, Tesco accepts that its size means close regulatory and political scrutiny is inevitable. Mr Clarke says Tesco has nothing to be ashamed of, judged on its record of job creation, lowering prices and raising standards. "When you have made yourself important in the lives of many consumers, of course governments and politicians are going to be interested," he argues. "What we have got to do is to make sure they understand how good modern retail is for consumers, markets and economies. "We are absolutely convinced that we do not abuse our position, would never want to and want to do the right things for customers." Despite Tesco's size and strength, its success is not guaranteed. It sold its French grocery business in 1997 after five largely unsuccessful years and is exiting Taiwan after failing to make a success of the market. It faces big challenges establishing itself in China and India, while its planned US expansion has also made some analysts nervous, despite most seeing it as a cost-effective way of entering the market. "It is a very sophisticated market and UK retailers haven't done very well there," Mr Ratner says of the US. As it starts to strain its growth limits in the UK, Tesco is looking to its foreign stores to drive future sales growth. Key markets are profitable but Tesco warns that future growth will depend as much on the strength of Asian and European economies as on its own performance.